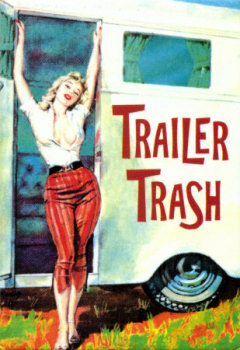 You won't see trailers discussed much in the homesteading world. Everyone wants to build their dream home, and I have to admit that I began my homesteading voyage with a similar inclination. I researched strawbale houses, earthships, and cob. I drew floorplans and crunched the numbers on passive solar heating. And then I crunched some less enticing numbers. Using a very lowball figure of $20 per square foot, a twenty by twenty foot house would cost $8,000 to put together, plus months of labor. Neither Mark nor I was interested in getting a full time job just to pay for building a house, and we knew that if we jumped into the rat-race we'd have to hire folks to help us build the house since we'd no longer have time to do the building ourselves. When I sat down and thought about it, I realized that what I wanted was to be on the land right away, to be putting energy into creating a wonderful garden. "What about a trailer?" Mark asked tentatively. "We could move in almost right away, and then if we want to build a house later, we can." As usual, his suggestion was brilliant. A trailer it was!